When you think about the Caribbean, the first thing that will probably pop into your mind is long sandy beaches with aquamarine water. But the region is also home to verdant and stunning countryside. One of the most charming towns on the Caribbean slope of the Cordillera Central Valley in Costa Rica is Turrialba. Sitting on the banks of a river, which bears the same name, the tiny town is elevated about 132 feet above sea level. The entire Turrialba Valley is located is known as an agricultural hub in Costa Rica, growing crops like bananas, coffee and sugarcane. To experience its agricultural side, consider visiting one of the plantations in the valley area. A visit here brings you to the midst of pristine tropical forests, roaring rivers and lush mountains. Turrialba’s proximity to several rivers in the region, has made it the perfect access point for kayaking and rafting enthusiasts. Most notably, great white-water rafting adventures are offered through tour operators in town. One of the most popular rafting sites is the wild Reventazon River. But the Rios Pacuare, which also flows near town is also equally a rafter’s dream destination. Both rivers have made a name for themselves in the international white water rafting scene with their rapids of varying levels. It is easy to book a rafting tour once in Turrialba as there are more than enough operators in the area. If you are a rafting novice, don’t worry, the operators will be able to bring you to rapids that are perfect for beginners, but are still very much fun to ride on. Turrialba is the preferred gateway to two major attractions in the region, Guayabo’s Columbian ruins and the astounding Turrialba Volcano National Park. The Guayabo National Monument is a place full of mystery and wonder. 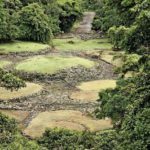 Fortunately for the public, this pre-Columbian site is open to anyone who wishes to explore it. Coming here gives you an interesting insight to what life used to be like circa 1000 BC to 1400AD. Just close to Guayabo is the Center for Agronomy Research and Development, which is one of the foremost tropical agriculture research centers in the world. The facility encompasses more than 2,000 acres of land, and conducts advanced research on plants/trees that have been collected from various parts on Earth. 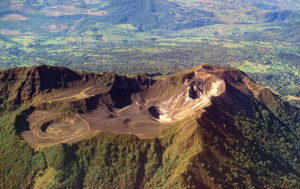 Turrialba Volcano National Park is home to an active volcano. Trekkers make their way to this remote part of the country for a chance to access the crater, which is quite a rare opportunity. When you finally reach the summit (on a clear day), you will be rewarded by the view of the Poas, Irazu, and Barva volcanoes in the far distance. The volcano is only about 15 kilometers from town. It is far from being the most visited volcano in Costa Rica, but this fact gives you the chance to have a more authentic volcano climbing experience. As a town, Turrialba is quiet and very laidback, as is usually true about mountain villages. But if there’s one thing that ignites the excitement of the locals, it would be baseball. Turrialba is so passionate about baseball that they manufacture the Rawlings baseballs, which are bring use in the Major League games. You can find Turrialba and the valley region just 40 miles east from the capital of San Jose. For a map of Costa Rica, click on Here. Or a Costa Rica/Panama travel atlas, click Here.